Reaching a goal by August 20: Well, I’ve now passed 4000 miles of bicycling for the year. With continued good health, I should easily be able to surpass my 5000 mile accomplishment last year. The owner did so, while I carefully approached the yellow-phase rattler, getting pretty close but placing my bike between it and me. I got out my camera, placed it on my saddlebag to steady it, and took the photo of it with its seven rattles pointed up into the air, buzzing away. The two women arrived, amazed at the sight and sound. 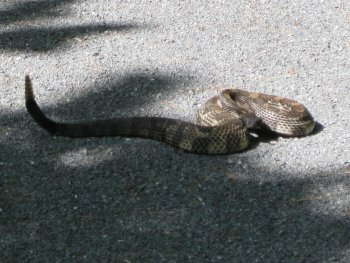 After we stood there awhile, with “Rover” squirming in the one woman’s arms but not barking, the rattler apparently eventually perceived us as no real threat, stopped rattling, and calmly slithered off the trail up into the woods. The dog’s owner thanked me for “saving” her dog by warning them of the snake, and I cycled away. Dear readers: Please obey the rule that says that dogs have to be leashed on the rail trail. By complying, you are being considerate of others (especially bicyclists), and you may just be saving your pet’s life!